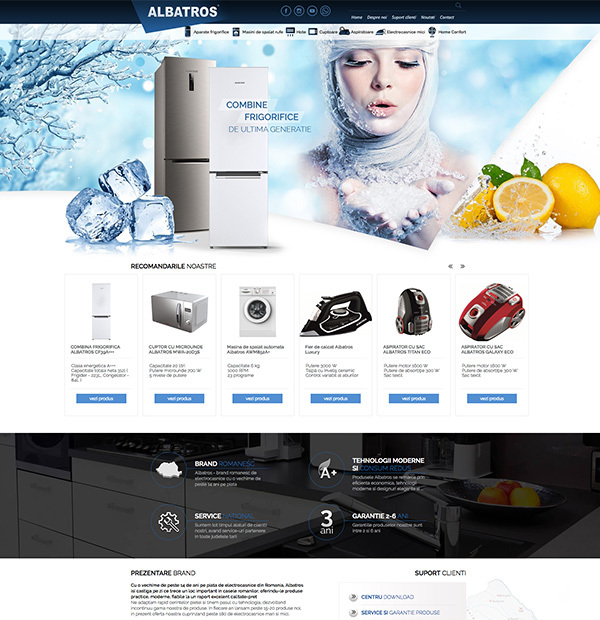 Presentation website development for Albatros- home appliances producer. Creating an online product catalog for Albatros. Albatros is a 100% Romanian brand with over 14 years of experience in the home appliance market in Romania that offers practical, modern, reliable products at an excellent price-price ratio. Albatros products are currently marketed in over 200 partner stores in the country and in the online environment of the largest specialty stores. The website designed by Royalty Webdesign for Albatros is an online product presentation catalog. It provides all the necessary information about the products: images, photo galleries, presentation information, technical data, assembly data, user manual, technical data sheets, warranty specifications, list of partner services, etc. The website also provides information about the company, services, news and events.